The iconic Air Jordan XIV, a silhouette that was inspired by the Ferrari 550 Maranello, will return to retailers in multiple different colorways in the coming weeks, starting with the beloved "Candy Cane" rendition on April 6. Additionally, Jordan Brand has announced release details for an all-new premium "Ferrari" themed Air Jordan 14, similar to the luxurious red suede version that debuted in 2014. This time around, the 14s are constructed of a golden, tumbled leather, equipped with a black leather tongue and carbon fiber detailing throughout the sneaker's unmistakable "shark teeth." Additional details include university red accents on the tongue and matching "23" branding on the heel. 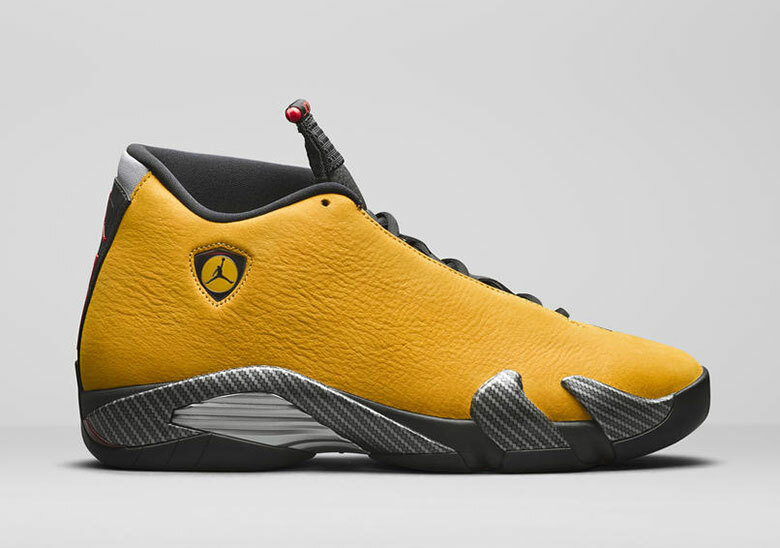 "MJ’s love for Italian sports cars has served as inspiration for many of his sneaker designs and this colorway matches one of the most famous of these, the AJXIV, with a flashy new finish." The kicks, priced at $200, are slated to launch on June 22.